Edwardsville City Hall is located at 118 Hillsboro Avenue, Edwardsville, IL 62025; phone: 618-692-7531. Photo: Benjamin Stephenson House, ca. 1820, 409 South Buchanan Street, Edwardsville, IL. Listed on the National Register of Historic Places in 1980. Photographed by User:RKlawton (own work), 2007, [cc-by-3.0 (creativecommons.org/licenses/by/3.0)], via Wikimedia Commons, accessed February, 2013. Edwardsville promotes itself as the 3rd Oldest City in Illinois. Edwardsville has a rich history. It is known for its political orientation, economic base, and for its growing population. It is one of many key communities in the Metro East region that is not only growing in size and area, but in quality as well. As Edwardsville develops, policies have been enacted to attract only quality growth in Edwardsville. One must first understand Edwardsville's history before truly understanding how and why Edwardsville is the way it is today. 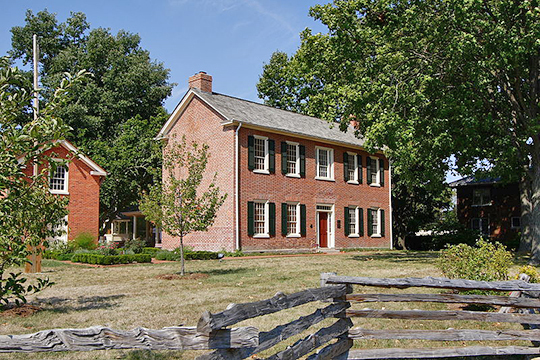 Thomas Kirkpatrick, his two brothers, and a clan of the Gillhams, founded Edwardsville in approximately 1805. Kirkpatrick purchased a 100-acre land warrant from Pierre Lejoy, who received the warrant by enrolling in the U.S. Militia in 1790. In 1809, Illinois and Indiana became two separate territories and Ninian Edwards became the first Territorial Governor of Illinois. He designated Thomas Kirkpatrick's house as the county seat. Because of Edwards and Kirkpatrick's working relationship, Kirkpatrick platted a town on his land and named it Edwardsville in 1816. After serving as the Territorial Governor, Edwards served as a U.S. Senator from 1818 to 1826 and serving as the third governor of the State of Illinois from 1826-1830. These events established Edwardsville as a politically-oriented town. As such, four more Illinois Governors were from Edwardsville: John Reynolds, Thomas Ford, Edward Coles, and Charles Deneen. Following the political nature of Edwardsville, both Abraham Lincoln and Stephen Douglas visited Edwardsville in September 1858, prior to the famous Lincoln-Douglas debate in Alton and Jonesboro, Illinois. Their presence and speaking ability gave Edwardsville residents another reason to become politically active. In 1850, the State of Illinois had a population of 851,470. This population not only made for a good political base, but for a good economic base as well. Ninety-two percent (92%) of the population in 1850 were farmers. Edwardsville followed in this trend. Because of the many railroad lines that passed through town, Edwardsville became a market center. It was known for bituminous coal mining and agriculture. Edwardsville continued to grow tremendously through the 20th Century. Although the community experienced the economic bust of the Great Depression, it quickly rebounded with the development of new grade schools and Southern Illinois University. City of Edwardsville, Comprehensive Plan, 2010, www.cityofedwardsville.com, accessed February, 2013.